Kaunas, located in the confluence of Nemunas and Neris rivers, with thousand inhabitants is one of the most significant cities of Lithuania. It could be described as a city that never accepted its role as the second city in the country. It is not only a city of old traditions, but also a large centre of business and industry. It can also lay claim to be a city of young people with over 35,000 students (the largest number in Lithuania) studying at one of the seven universities here. Gothic architecture, defensive fortresses, footprints, left by various ethnical groups that used to live there, museums, Kaunas as the capital of the First Lithuanian Republic, rationalism and functionalism in architecture – these are only several of the possible routes for the first acquaintance with Kaunas. 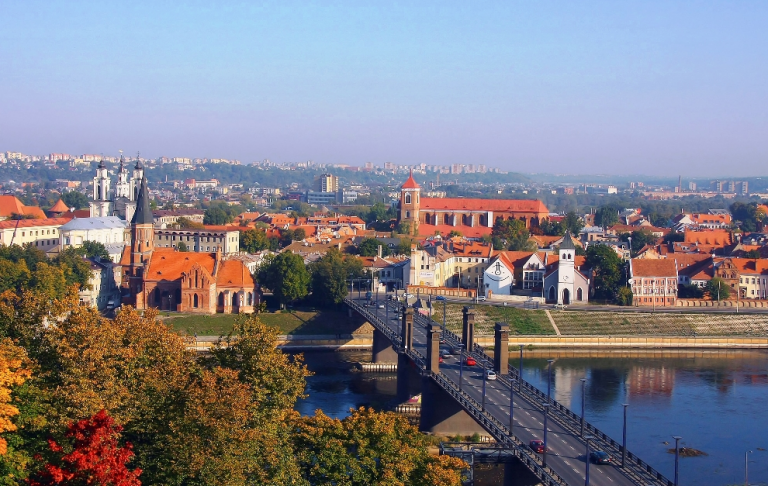 Kaunas was always fated to become an important historical and cultural city in Lithuania. In 1408, Magdeburg rights were granted to the city of Kaunas by the privilege of Vytautas the Great. During the early 20th century, governed by its first Burgomaster Jonas Vileisis, Kaunas was the home of the Lithuanian Government and the capital city; a period considered by many as the golden age of the city. However, history tells us that even before this date, the city, situated at the confluence of the rivers Neris and Nemunas, experienced many other periods of great prosperity and national importance.